Let’s face it. 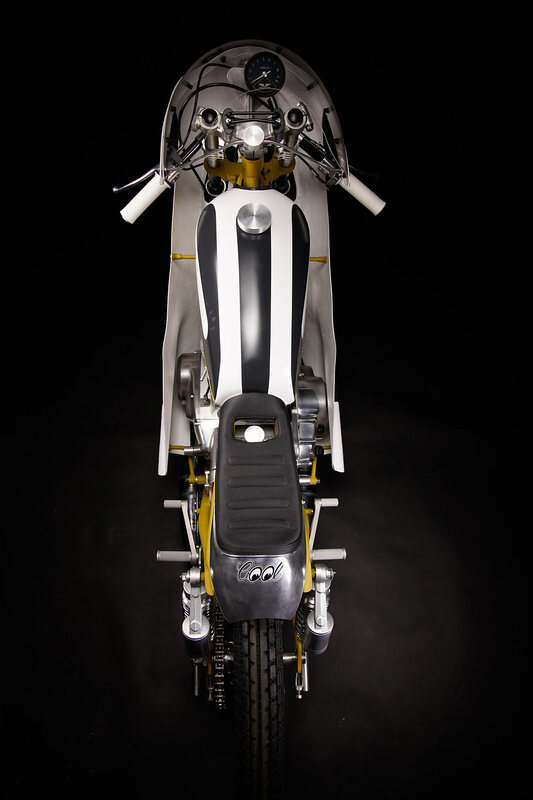 The days of new road legal two-stroke motorcycles are fast being resigned to the scrap heap of history. 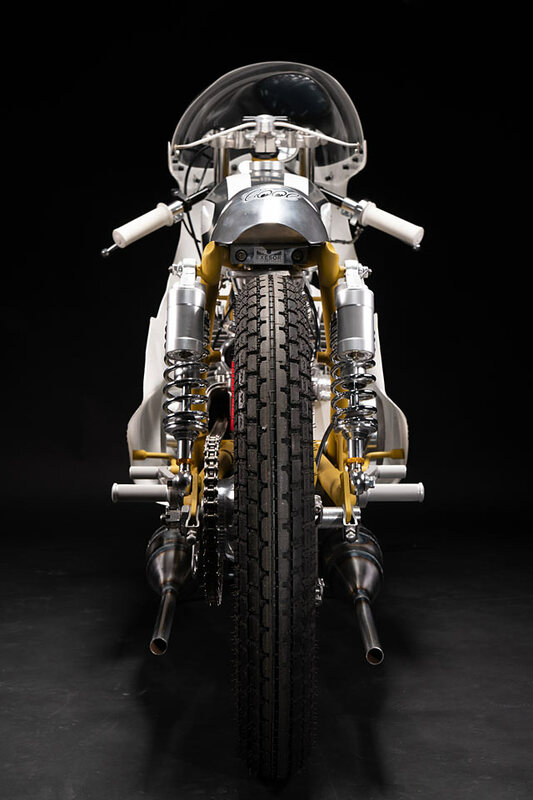 Thankfully, the scrap heap is exactly where Christian Schwarzenlander gets the donors for his projects, he simply refuses to start a build with a bike that runs. 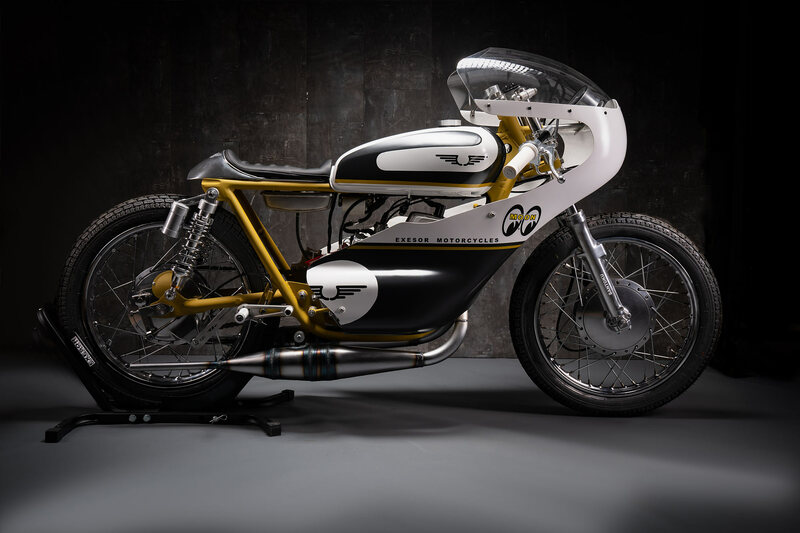 The owner of Austria’s Exesor Motorcycles had stumbled across an old, dead smoker at a giveaway price and with a love for 1970’s racing it was the perfect chance to combine the two. 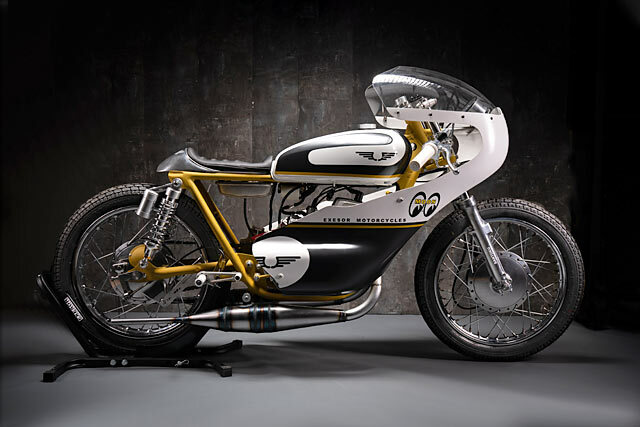 The end result is this simply stunning ’76 Suzuki GT250 two-stroke racer called ‘Santoku’. 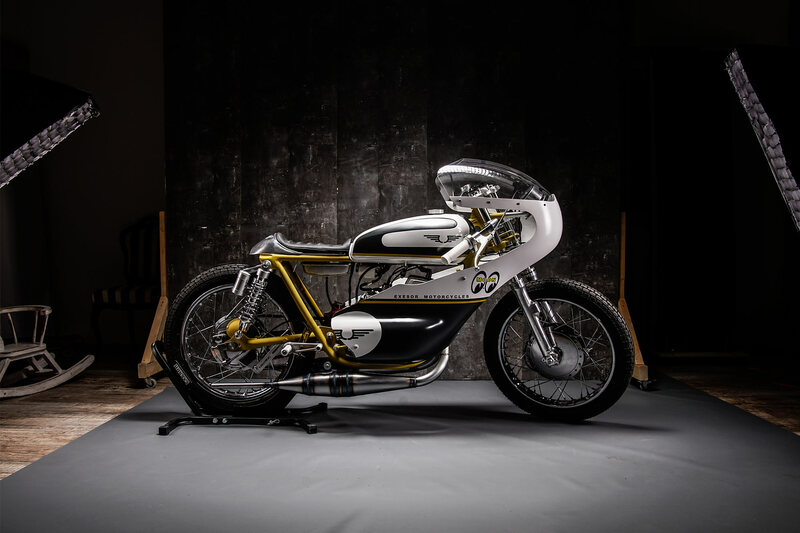 Think of any style of custom bike and Christian has built one, but a race replica was the last on the list and finding the GT was the chance to complete the set. “It was a typical barn find, it was a piece of scrap. A rolling chassis with an open engine, very rusty and extremely dirty. About a 10mm layer of dirt covered the engine and I was thinking about leaving it there where I have found it. But in the end I bought it for a few bucks and made into my new project,” he smiles. The state of the bike meant this would be a full rebuild as well as customisation job, a challenge Christian loves as he relishes the chance to make his own parts to go on each build. “The 2-stroke bike era is over. 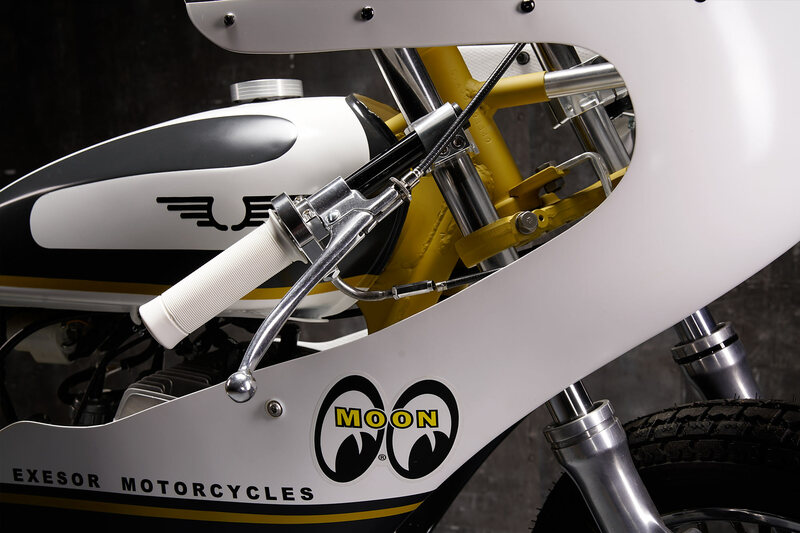 The winning race bikes from the 70 ́s are forgotten. That is a pity since the technology is quite simple… Tougher environmental laws have banned the 2 stroke bikes from our streets. 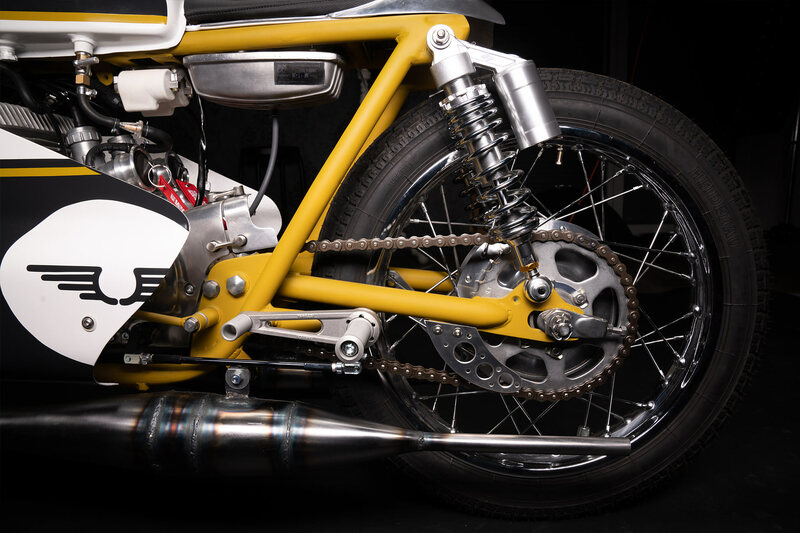 This fact guided Exesor to build a 2-stroke bike; The plan was to build a bike which should be a combination of a classic race bike and a custom machine,” he recalls. The build started by breaking down the bike into its bare bones, boxing things up and deciding which parts could be saved and which ones were too far gone. Then Christian fired up the angle grinder and started to smooth and shape the frame into the design he had created in his mind. Much of the rear subframe has been cut off, tabs cut and thrown away left right and centre, and changes made for the bodywork that was planned to follow. Before sending the finished item out for a coat of colour, a very cool yellow mustard. 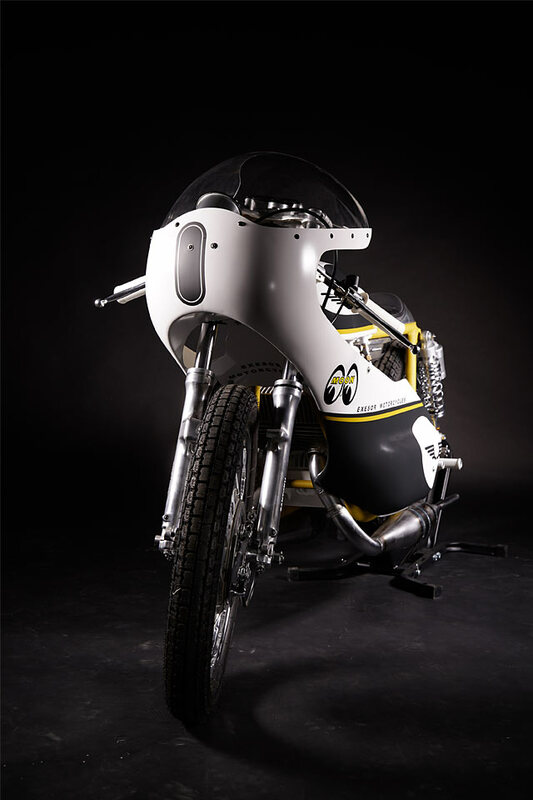 The bodywork is make or break on a race replica and the first piece chosen for the job was a replacement fuel tank. This was taken from an old Yamaha LS2, that has been totally smoothed out and restored before being fitted up with a machined race style filler cap. 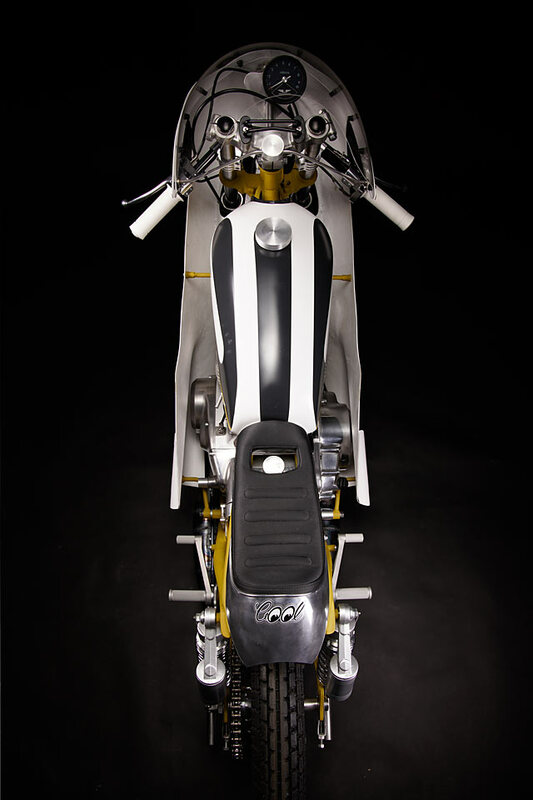 The large front fairing is a quality item, made from polyester resin reinforced by fibreglass, the only problem being it was designed for a much larger Yamaha race bike. This meant that not only did it have to be trimmed and massaged to fit but that each and every mounting bracket had to be fabricated by hand. But that’s just the way they like things done at Exesor, and the tail-piece is another example of being willing to take on a challenge. The rear hump started life as a well used and badly beaten old fender that has been carefully shaped and polished until the brilliant piece before you was revealed. While underneath an old Ural valve cover was chosen as the metal from which the oil tank would be made. But this too provided problems, being so gunked up and ingrained with grease that it had to be cleaned multiple times before the welds would take. From every angle the paint job is stunning and truly befitting that of a race replica ready to look resplendent in the pit paddock. It was purely by chance that the colours chosen happen to match the Mooneyes logo, of which Christian is a big fan, and was added after the job was completed. Also adding to the period drama is the stunning front drum brake taken from an old 500cc Suzuki race bike. With polished hubs front and rear, a set of new chromed rims and stainless spokes, the vintage rubber completes the look. But the engine the bike had come with would never have run left untouched, having spent much of its life, cases split, in the open rain. A full rebuild in-house was undertaken including a completely overhauled crankshaft to get the bottom end spinning. 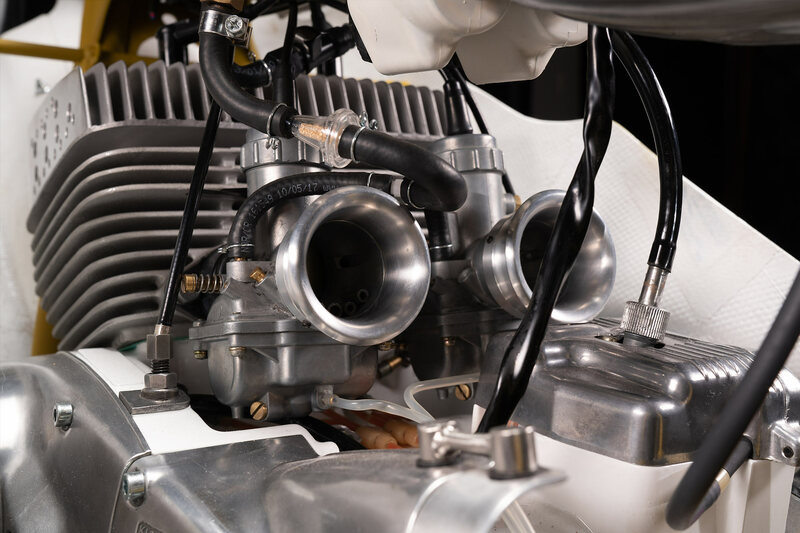 Feeding the fuel is a set of new Mikuni carbs, fitted with Exesor’s own velocity stacks that along with the entire engine has been beautifully polished. But like with any smoker, the sight and sound all comes down to the pipes and the in-house rolled and fabricated expansion chambers are a feast for both eyes and ears! 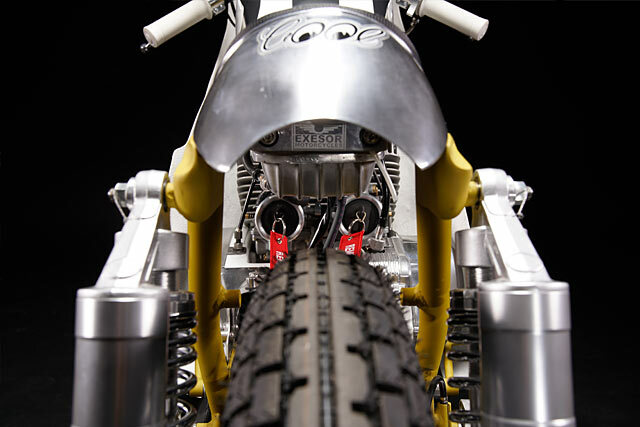 During the final assembly Christian rebuilt the front forks, added a set of his own CNC’d bars and installed a new set of rear shocks. 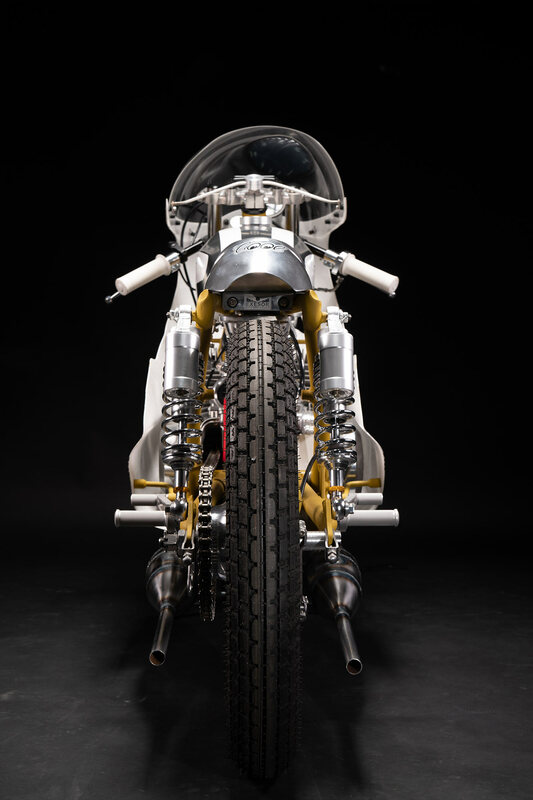 While Tarozzi rearsets add to the racing feel, the leather seat and lithium battery add a touch of luxury and usability to a bike that stays true to the stunning hand-built race bikes of old. So what’s in a name; Santoku, it comes from the Japanese knife that has three precise tasks to perform. 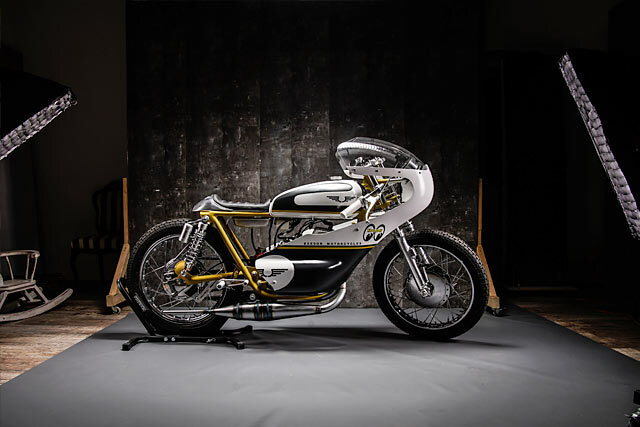 In this case, to resurrect the old, to build a truly remarkable one-off racer and to revive that two-stroke magic; for Exesor Motorcycles it’s job done, with cutting precision!